Trevor Story set the home run record for rookie shortstops, passing former Rockies shortstop Troy Tulowitzki, in a two-home run effort vs. Atlanta. Trevor Story belted his 24th home run of the year in Friday's win, tying a rookie record for shortstops. 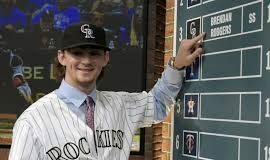 Brendan Rodgers, the Rockies 19-year old shortstop, was ranked ninth in ESPN's Keith Law's top 50 prospects. Whose spot on the infield is he going to take? Trevor Story has made a splash during his rookie season, but all everyone talks about is his ability at the plate. What about his fielding? Trevor Story was humble in his third-place finish in the All-Star Final Vote, but his teammates and managers were not shy about saying he deserved better.